EK releases new EK-Tube ZMT soft tube for liquid cooling! EK Water Blocks, Ljubljana based premium liquid cooling gear manufacturer, is expanding its soft tubing portfolio with a release of two new EK-Tube ZMT tubing! ZMT stands for Zero Maintenance Tubing and EK-Tube ZMT is a high quality, industrial grade EPDM rubber tubing in stylish matte black. This tubing is – just like Norprene – designed to withstand harsh conditions for a very long period of time, offering a truly exceptional lifespan even under UV, ozone and heat exposure for many years. EK-Tube ZMT has no evaporation rate, which means that no liquid can evaporate through the tube walls. Unlike most PVC and PUR tubing this high quality EK made EPDM rubber tubing ensures long lasting operation and does not suffer from a plasticizer leaching effect which can cause blockage (gunking) in your liquid cooling loop. This tubing also allows for very small bend radius! It is guaranteed to be hassle-free even in the long run, which is something other PVC/PUR tubing cannot offer! EK recommends EK-ACF Fitting series compression fittings for the use with this tube. EK offers three different dimensions and provides OD (outer diameter) and ID (inner diameter) with every model. For every dimension, EK offers retail version with 3 meters of tube, but customers can also buy any length as “per meter” option is available as well. Three different tube sizes with related dimensions. 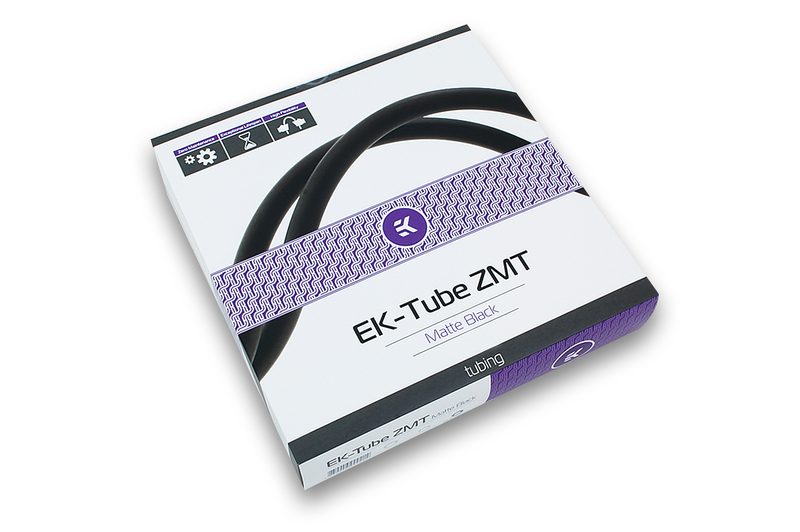 New EK-Tube ZMT retail box. EK-Tube ZMT is made in Slovenia, Europe and is readily available for purchase through EK Webshop and Partner Reseller Network. In the table below you can find MSR prices with VAT included.